The largest tree-living animals in existence, orangutans are an icon in Malaysian minds and memories. But very soon, we may lose them for good. In just 20 years, the orangutan population has decreased by almost 50%. Back in the mid-80s, Sabah itself had a total of 20,000 orangutans. According to WWF Malaysia, there’re only 11,000 now. The culprits? 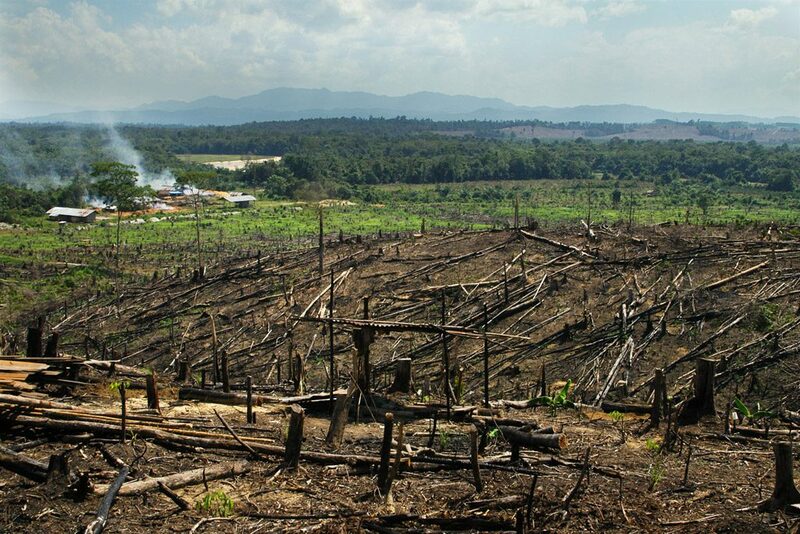 Inhumane poaching and deforestation. These two reasons alone kill up to 2,500 orangutans a year. You may ask, aren’t the government or NGOs doing something? They are doing something, right? They are already investing over US$30 to 40 million to help with the declining rate of wild populations annually. But it seems like that still isn’t enough and awareness needs to be raised more. It’s a battle that has to be fought on multiple fronts. To kickstart a change, the Sabah government is now committed to certifying its palm oil. But How Does This Play A Part To Help Our Primates? When grown unsustainably, oil palm agriculture can have damaging impacts on the environment, potentially destroying forests and the habitats of wildlife, such as our beloved orangutan and Sumatran tiger. The Roundtable for Sustainable Palm Oil (RSPO)—through the implementation of a set of environmental and social criteria which members should comply in order to meet certification standards—works with different stakeholders to minimise these negative impacts. The said criteria prevent RSPO members from clearing primary forests or high conservation value areas for palm oil. Through this, RSPO envisions to create a space where palm oil agriculture and the environment can co-exist. For the socially aware, there are criteria that also touch on proper practices such as how growers and millers are to contribute to local sustainable development wherever appropriate. No new plantings can be established on local peoples’ lands where the rights of the local people including the indigenous community are affected. One way of ensuring this is by making sure that consent is given by these communities freely. There are results showing how being certified is enough to make a difference. There was a study called “An Impact Analysis of RSPO Certification On Borneo Forest Cover and Orangutan Populations” conducted this year. It delved into how having a sustainable plantation can create a positive impact to the environment compared to an unsustainable plantation. 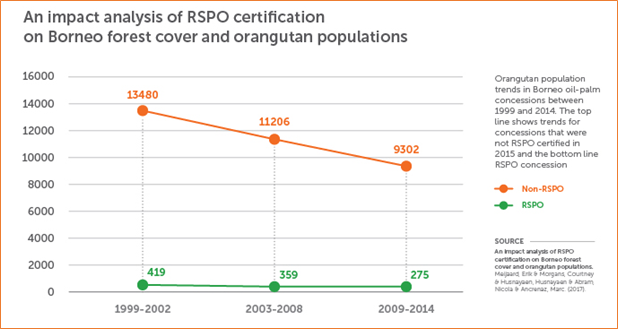 The study showed that RSPO-certified concessions lose 25 times less forest than non-certified ones. This further proves that non-certified companies have made no real attempt at stopping deforestation and they have very little incentive to do so. Positive impacts of RSPO certification so far demonstrate that these standards can work for Malaysian palm oil. However more plantations just need to start implementing good practices regarding forest conservation and the conservation of orangutan habitat. About 10,000 orangutans are found in areas that have been allocated for oil palm development. They’re actually very adaptable, and with the right management, can survive side-by-side with plantations and agricultural lands. However, they’re slow breeders. If these areas are converted to plantations without changes in current practices, the steep population decline will continue. So it’s really crucial for their habitats to be conserved so the orangutans will not be distressed by any sudden changes and can build their population safely in their own territory. 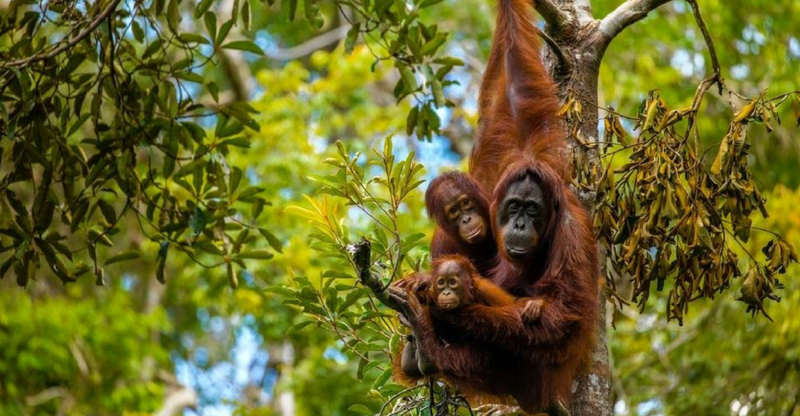 “Viable populations of large roaming animals such as the orangutan require a network of protected forests that are properly managed, and sustainable practices outside of these protected areas,” said Dr Marc Ancrenaz, a Sabah-based orangutan scientist. Since oil palm plantations certified by RSPO must abide by its Principles and Criteria (i.e criteria 5.2 where the status of rare, threatened or endangered species are to be maintained), orangutans and other wild animals that exist in RSPO-certified oil palm plantations will be protected by the plantations—or they will risk losing their certification. “We also call on oil palm plantations to allocate part of their lands as wildlife corridors so that wild animals such as orangutans and elephants can travel in and out of the plantations, and join the rest of their population in adjacent forests,” said Max Donysius, Sustainable Finance & Business Industry Engagement Coordinator, Sabah Terrestrial Conservation Programme. What Can WE, As Average Consumers Do? The sector that can really lead in solving this issue are the Bornean oil palm producers themselves, with changes in their policies and ramped up conservation efforts. Kudos to Sabah State government for taking the first step in 2015, and pledging their commitment to a jurisdictional approach to getting their palm oil RSPO certified. This approach utilises the government’s initiatives in collaboration with the private sector and local NGOs to work towards long-term solutions for sustainable development. It’s a significant step towards collectively working to improve the livelihoods of small-scale farmers and conserving the important forest areas for biodiversity and environment. Since then, Central Kalimantan and Ecuador have followed suit. Businesses are another party who can be more involved. You have big names like Sime Darby, one of the largest producers of certified sustainable palm oil, who have sponsored reforestation in Bukit Piton Forest Reserve, a formerly degraded orangutan habitat. The 10-year project which was started in 2008 in partnership with the Sabah state government and WWF Malaysia, is a great show of what real collaboration can achieve. A total of 4,724ha of degraded land has been reforested with 350,000 seedlings of various trees, and is now becoming more habitable for the orangutans. Consumers have an equally important role to play in driving a stronger demand for CSPO, which in turn helps out with these conservation efforts. RSPO has made it easier for consumers to recognise products that use sustainable palm oil. Just keep a lookout for their trademark. Make sure these go into your shopping basket. With just a few more seconds added to your shopping time, it does make a difference. You could go the extra mile and reach out to your favourite brands to ask if they’re using certified sustainable palm oil (CSPO). You could even request for manufacturers and retailers to source CSPO, not only in their own-brand products, but in all the products they use or sell. Taking time to research and understand what ingredients are in your food and household products and how they might impact the wellbeing of people and the environment is also a huge step in improving our mindset as consumers. When we show the right kind of demand, the right kind of supply will eventually follow. Orangutans have been known to express care and empathy, not just to their own kind, but even to other species, like us. Let’s just say it would be better that we don’t get outdone by an animal when it comes to showing compassion.